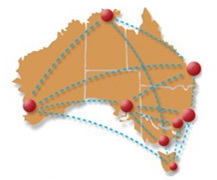 Many New South Wales towns available on request. And many other towns and cities. Boat Transport between depots is usually the cheaper option, but pick-ups and deliveries are no problem even if you are located somewhere not mentioned above we can usually organise a solution. In most cases if we can't help you with you move we can point you in the right direction. Please note that when requesting the process much faster and more acurate if you have the overall dimensions of your item (including drawbar, mast, outboard, spare tyre or any other item that influences the overall dimensions) and the weight is often helpful as well. Before we can transport your boat the following requirements will assist to ensure a safe and trouble free journey. Most boat covers should be removed for transport due to the high wind conditions on trucks. Covers are left on at owners request and risk. Bimini tops and any other removable covers such as clears should be removed as high wind conditions on a truck can cause damage to both the covers and the boat.